Electrocochleography or ECochG is a technique used to record electrical responses from the inner ear and the auditory nerve in the first 5 ms after stimulus presentation. Typically, a click or tone burst is used as the stimulus; however, other stimulus parameters (polarity and repetition rate), recording parameters, and recording sites can also vary (promontory needle, earcanal tiptrode, and tympanic membrane tymptrode electrodes).1,2 The two main components of the ECochG response are the summating potential (SP), primarily from the hair cells of the cochlea, and the action potential (AP) of the auditory nerve fibers. Presently, ECochG has considerable clinical application in the diagnosis of endolymphatic hydrops in Meniere’s disease and auditory neuropathy, with recent application in cochlear synaptopathy and cochlear implantation. One of the main clinical application of ECochG is in both diagnosing and monitoring Meniere’s disease/endolymphatic hydrops (EHL).1 The following has been identified in those with Meniere’s disease/EHL: enhanced SP amplitude, enlarged SP/AP amplitude and area ratios, and an increase in AP latency difference between condensation and rarefaction responses to click stimuli.1,3 The SP/AP amplitude ratio is currently the most widespread ECochG measurement for diagnosing Meniere’s, with a ratio higher than .3 to .4 suggestive of EHL, when using an extratympanic approach.4 However, the SP/AP magnitude ratio is not infallible. 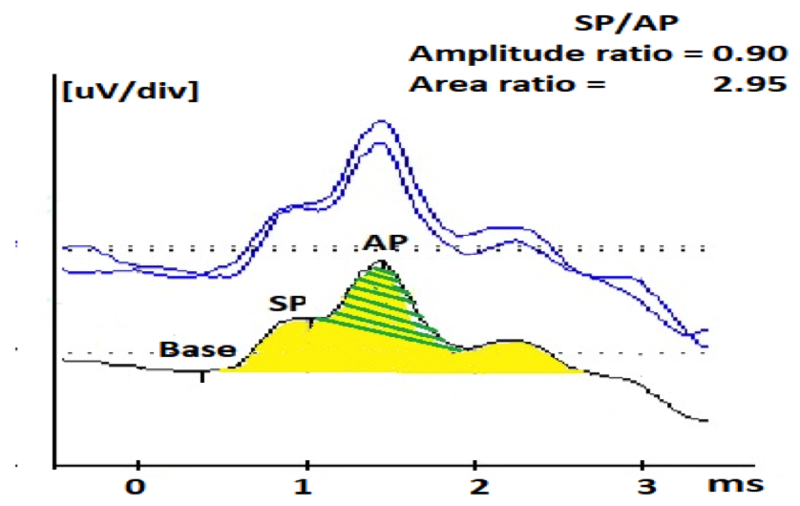 According to Gibson, the amplitude of the AP can differ depending on the degree of hearing loss at high frequencies.5 The SP/AP amplitude ratio can also vary depending on the cutoff criterion for normal SP/AP ratio, the diagnosis (ELH or Meniere’s disease), recording time (symptomatic versus asymptomatic), and stage of the disease because there is a chance that ELH is not present in the early stages of Meniere’s disease.5 Because of the low diagnostic sensitivity of ECochG, 83% of the members of the American Otological Society and the American Neurotology Society rely more on the clinical symptom-based diagnosis of the disease.6 Since the SP/AP amplitude ratio is only enlarged in about 60% of Meniere’s patients, one way to improve the diagnostic sensitivity is to also include the SP/AP area ratio (normal <1.94).7,8 Figure 1A and B display click ECochG recordings from two different patients with Meniere’s like symptoms (vertigo, mild low frequency sensorineural hearing loss, and ear fullness). Figure 1A displays the ECochG response from the right ear of the first patient, a 49-year-old female, revealing normal SP/AP amplitude ratio, whereas the SP/AP area ratio is abnormally large. If the audiologist depends on only measuring the SP/AP amplitude ratio, the ECochG finding would be negative for ELH (aka poor sensitivity). The second patient is a 30-year-old female who has a definite diagnosis of Meniere’s disease and her ECochG response from the left ear showed abnormality in both the SP/AP amplitude (.90) and area ratios (2.95) (Figure 1B). It can be concluded from these two cases that the SP/AP area ratio is important to diagnose ELH in the first case and to confirm the objective diagnosis of ELH in the second case. Figure 1B. Averaged 90 dB nHL ECochG response to 7.1 clicks/s from a 30-year-old female patient with Meniere’s like symptoms showing abnormally large SP/AP amplitude ratio (0.90) and area ratio (2.95). Green shaded area is the AP area and both of the green- and yellow- shaded areas constitute the SP area. Another method used to help in the Meniere’s/EHL diagnosis is using two different polarities (condensation and rarefaction) to evaluate the difference between the AP latency; a difference of 0.38 ms is an indication of ELH.9,10 The reasoning behind this latency difference has to do with velocity changes of the traveling wave due to the large amounts of endolymph in the cochlea. This causes the vibrations of the cochlear partition to be restricted; therefore, the velocity of the traveling wave varies based on whether the cochlear partition is moving upwards with rarefaction or downwards with condensation. Since the AP latency is dependent on the velocity of the traveling wave, a difference in AP latencies between the two polarities can be noted.9 For any of these methods, one approach to make the ECochG more sensitive is to evaluate patients when their symptoms are occurring.9 This is not always possible due to how often symptoms fluctuate and the patient’s compliance to being tested during a Meniere’s episode. One technique that could benefit in the differential diagnosis of Meniere’s disease is known as the Continuous Loop Averaging Deconvolution (CLAD) technique. The CLAD procedure applies an algorithm to separate the waveforms from measurements performed at high stimulus rates. An example of ECochG to fast click rates (Figure 2) was recorded from the author of this paper (WK). Figure 2 displays a complex convolved response, obscuring SP and AP waveforms at fast rates, and that is where the CLAD technique comes in to deconvolve (unravel) those complex responses to fast rates (Figure 3). As shown in Figure 3, CLAD allows three main advantages: (1) separating the SP and AP waves at fast rates, which reduces the difficulty in labeling SP and AP,11 (2) assessing the origin of the SP response, and (3) studying the rate of neural adaptation (reduced AP response with fast rate). Data from Figure 3 and other studies12 showed that SP amplitude remains stable at fast rate whereas the AP amplitude undergoes neural adaptation, indicating that the SP response is dominated by presynaptic cochlear hair cells and the AP is generated from the cochlear nerve.12,13 Compared to normative ECochG findings,13 results of a small pilot group with Meniere’s disease revealed similar trends, but with a slight increase in AP latency and a decrease in AP amplitude with increasing stimulus rate.14 These preliminary findings suggests that Meniere’s disease may affect the neural function of cochlear nerve and/or cochlear synapses. Previous results of abnormal acoustic reflex decay in 22–27% patients with Meniere’s disease15,16 and a reduced number of synapses between inner hair cells and cochlear nerve fibers in Meniere’s disease,17 support the presence of neural damage. Figure 2. Convolved, overlapped ECochG responses at each of the seven click rates showing repeatable responses and their averaged responses at each click rate. Figure 3. 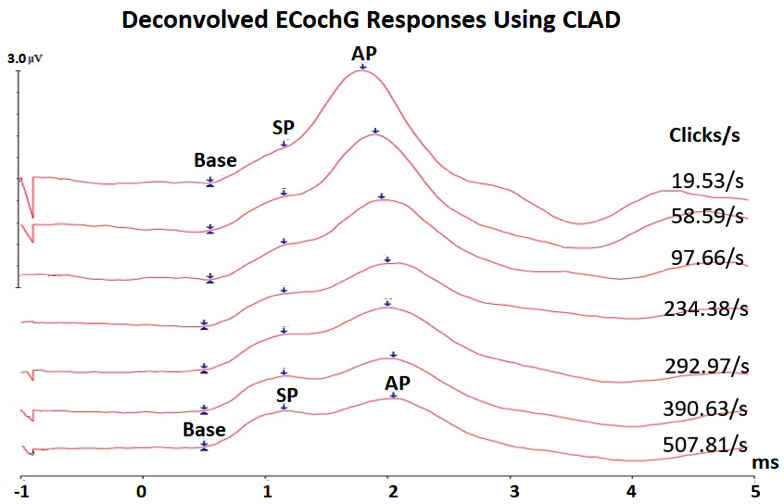 Averaged deconvolved ECochG using CLAD technique showing that the SP waves remain stable in latency and amplitude, whereas the AP waves shifts in latency and decrease in amplitude with increasing click rate, allowing better identification of SP and AP waves. 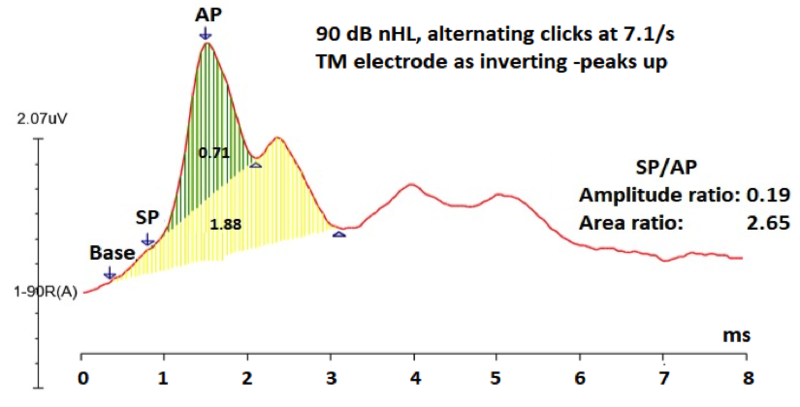 Considering the imperfect sensitivity of the click ECochG SP/AP ratio, the use of toneburst stimuli may advance the specificity of ECochG and perhaps earlier detection of the disease, which first affects the apical half of the cochlear spiral that is tuned to low frequencies. One research study recorded toneburst ECochG to 500 Hz and 2000 Hz at three stimulus durations (12, 6, 3 ms) and five stimulus rates (from 7.1 to 234.3/s).18 They reported that SP amplitude was larger for fast rate, longer duration, and 2000 Hz tonburst stimuli, while AP amplitude was larger for slow rate and short duration toneburst stimuli. The enhancement of the SP amplitude at fast rates is due to minimizing the neural contributions from the auditory nerve. Figure 4. Averaged electrocochleography responses from both ears of a case with normal hearing, but has mild SNR loss, and abnormal stapedial reflex thresholds and growth function. ECochG shows abnormally large SP amplitude, small AP amplitude, resulting in large SP/AP amplitude and area ratios, bilaterally. These findings are consistent with cochlear synaptopathy. Although ECochG technique is not one of the most common audiological assessments in clinical settings, it has a range of valuable clinical applications in the evaluation of the inner ear and auditory nerve function. Its applicability in classification of Meniere's disease and differential diagnoses of various inner ear disorders, cochlear synaptopathy, auditory nerve pathologies, and auditory efferent system continues to be researched. Funding was provided to Wafaa Kaf, the 2015 Emerging Research Grant recipient, by The Estate of Howard F. Schum, Hearing Health Foundation. Thanks go to Ms. Danae Foster for gathering materials from published papers and to Ms. Alaa Abdelhakiem for editorial reviews on earlier versions of this paper. Portions of this work were presented at the MARC-MANS meeting, St Louis, MO (July 17-19-2014) and at the Arab Cochlear Implants Conference in Dubai, UAE (April 5-7, 2018). Ferraro JA. Clinical electrocochleography: Overview of theories, techniques and applications. AudiologyOnline website. https://www.audiologyonline.com/articles/clinical-electrocochleography-overview-theories-techniques-1275-1275. November 15, 2000. Accessed April 2018. Chertoff ME, Lichtenhan J, and Willis M. Click- and chirp-evoked human compound action potentials. J Acoust Soc Am 2010;127:2992–96. Kumar P and Peepal P. Electrocochleography in individuals with Meniere’s disease. Indian J of Otol 2012;18(2):72–75. Katz J, Chasin M, English K, Hood, L J, and Tillery KL. Handbook of Clinical Audiology (7th ed.). Philadelphia, PA: Wolters Kluwer Health; 2015. Gibson W. The clinical uses of electrocochleography. Front Neurosci 2017;11:274. Nguyen LT, Harris JP, and Nguyen QT. Clinical utility of electrocochleography in the diagnosis and management of Meniere’s disease: AOS and ANS membership survey data. Otol Neurotol 2010;31(3):455–59. Ferraro JA and Tibbils RP. SP/AP area ratio in the diagnosis of Meniere’s diseases. Am J Audiol 1999;8(1):21–28. Al-momani MO, Ferraro JA, Gajewski BJ, and Ator G. Improved sensitivity of electrocochleography in the diagnosis of Meniere’s disease. Int J Audiol 2009;48(11):811–19. Ferraro JA and Durrant JD. Electrocochleography in the evaluation of patients with Meniere’s disease/endolymphatic hydrops. J Am Acad Audiol 2006;17(1):45–68. Margolis RH, Rieks D, Fournier EM, and Levine SM. Tympanic electrocochleography for diagnosis of Meniere’s disease. Arch Otolaryngol Head Neck Surg 1995;121(1):44–55. Roland PS and Roth L. Interinterpreter variability in determining the SP/AP ratio in clinical electrocochleography. Laryngoscope 1997;107(10):1357–61. Kiang NYand Peake W. Components of electrical responses recorded from the cochlea. Ann Otol Rhinol Laryngol 1960;69:448–58. Kaf WA, et al. Fast click rate electrocochleography and auditory brainstem response in normal-hearing adults using continuous loop averaging deconvolution. Ear Hear 2017;38(2):244–54. Dixon S, Kaf WA, Bextermueller K, and Jamos A. Fast stimulus rate ECochG and ABR using continuous loop averaging deconvolution in normal individuals and Ménière’s patients. Oral presentation at: MARC-MANS Meeting; July 2014; Saint Louis, MO. Olsen WO, Noffsinger D, and Kurdziel, SA. Acoustic reflex and reflex decay. Occurrence in patients with cochlear and eighth nerve lesions. Arch Otolaryngol 1975;101(10):622–25. Olsen WO, Stach BA, and Kurdziel SA. Acoustic reflex decay in 10 seconds and in 5 seconds for Meniere’s disease patients and for VIIIth nerve patients. Ear Hear 1981;2(4):180–181. Nadol JB Jr. and Thornton AR. Ultrastructural findings in a case of Meniere’s disease. Ann Otol Rhinol Laryngol 1987;96(4):449–54. Kennedy AE, Kaf WA, Ferraro JA, Delgado RE, and Lichtenhan JT. Human summating potential using continuous loop averaging deconvolution: Response amplitudes vary with tone burst repetition rate and duration. Front Neurosci 2017;11:429. Jensen JB, Lysaght AC, Liberman MC, Qvortrup K, and Stankovic KM. Immediate and delayed cochlear neuropathy after noise exposure in pubescent mice. PLoS One 2015;10(5):1–17. Liberman MC, Epstein MJ, Cleveland SS, Wang H, and Maison SF. Toward a differential diagnosis of hidden hearing loss in humans. PLoS One 2016;11(9):1–15. Bramhall NF, Konrad-Martin D, McMillan GP, and Griest SE. Auditory brainstem response altered in humans with noise exposure despite normal outer hair cell function. Ear Hear 2017;38(1):1–12. Ridley CL, Kopun JG, Neely ST, Gorga MP, and Rasetshwane, DM. Using thresholds in noise to identify hidden hearing loss in humans. Ear Hear 2018:1. Valero MD, Hancock KE, and Liberman MC. The middle ear muscle reflex in the diagnosis of cochlear neuropathy. Hear Res 2016;332:29–38. Santarelli R and Arslan E. Electrocochleography in auditory neuropathy. Hear Res 2002;170(1-2):32–47. Jamos A, Kaf WA, DiSarno N, Franklin C, Ferraro J., and Chertoff M. Suppressive Effect of Contralateral Noise on Cochlear Microphonic in Humans. Poster presentation at The American-Speech-Language-Hearing Association (ASHA) Convention, San Diego, CA; 2011 (Nov 16-20, 2011). Najem F, Kaf WA, Ferraro J, and DiSarno N. A Comparison between Contralateral Suppression in Cochlear Microphonics and Distortion Product Otoacoustic Emissions. Abstract J. Acoust. Soc. Am 2011;129(4):2593. Najem N, Ferraro J and Chertoff M. The effect of contralateral pure tones on the compound action potential in humans: Efferent tuning curves. J Am Acad Audiol 2016;27(2):103–16. Wafaa Kaf, PhD, is a professor of audiology in the Communication Sciences and Disorders Department at Missouri State University. Dr. Kaf earned her medical degree from the Faculty of Medicine, Assiut University, Egypt, obtained her master degree in audiology from the Ear, Nose, and Throat department, Assiut University, and earned her PhD degree in Audiology from the University of Pittsburgh, Pittsburgh, PA. Dr. Dr. Kaf has several publications and several national and international presentations in the areas of early auditory evoked potentials (ASSR, ABR, and ECochG) to study hearing threshold estimation, assess neural adaptation in Meniere’s disease and investigate the auditory efferent function. Dr. Kaf has received two Foundation Awards for Excellence in Research (2017) and Teaching (2009).